Mandatory Photo Credit: The Juice Online, Initra Marilyn. Syracuse attackman Nate Solomon scored three goals and goalie Drake Porter added 12 saves as the No. 11 Orange finished its ACC regular season schedule with a 12-9 win over No. 18 North Carolina at UNC Lacrosse Stadium on Saturday afternoon. After two quick goals by Syracuse to start the first quarter, North Carolina dominated the rest of the period, taking a 5-2 lead with six seconds to go after an unassisted goal from Timmy Kelly. That lead would expand to 6-2 after Nicky Solomon found Brian Cameron with 13:53 left in the second quarter. It was all Orange from there, with Syracuse scoring four straight goals to tie the game at six with 6:13 left in the half. The teams went into intermission tied at seven before SU completely took over in the second half. The Orange blanked the Tar Heels 4-0 in the third quarter, with Nate Solomon scoring a transition goal with one second left to give SU an 11-7 lead. 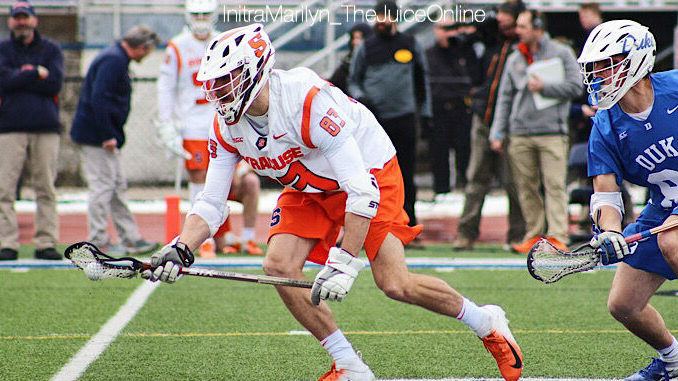 Syracuse seized momentum for good on its final goal of the game. With 9:55 to go, UNC goalie Caton Johnson stopped a shot and attempted to clear, but his pass was immediately intercepted by Bradley Voigt. He found Nate Solomon right at the doorstep, and after one pump fake, Solomon beat Johnson top shelf to give SU an insurmountable 12-7 lead. North Carolina added two more goals before Syracuse ran out the clock on its third straight win. Syracuse controlled in faceoffs, winning 15-of-24, with Danny Varello taking 13-of-18 at the X (he got off to a 10-for-10 start). Syracuse also was +8 on ground balls and +3 in clears. Stephen Rehfuss scored two goals and added an assist, while Nicky Solomon did the same for the Tar Heels. The victory leaves Syracuse at 2-2 in ACC play on the season, tied with Duke for the second seed. Virginia clinched the top overall seed in the ACC Tournament with a 4-0 record. Final seeding will be determined after Notre Dame (1-2) and North Carolina (1-2) play next Saturday. Syracuse finishes out its regular season schedule when it travels to Annapolis, Maryland to play Navy. Navy lost to No. 20 Army in overtime, 9-8 on Saturday.